This may come as a surprise to many, but in many of the world’s livestock-producing countries the farmers mix the animals’ feed with a tiny amount of antibiotics. According to them, this helps them grow and keeps them healthy. But what does that mean for us? Public health groups have spoken out against this practice, because when antibiotics are routinely provided, the bacteria inside the body becomes immune, developing a resistance to them. One of the serious growing health concerns in the world is antibiotic-resistant infections. There are many contributing factors to this problem, including the fact that antibiotics are over-prescribed by doctors to patients. But the small amounts fed to livestock are also contributing to this issue. These antibiotics are a major source of pollution for the human body. Storm water is next on our list of 3 kinds of pollution you may not have heard about. This refers to melted snow and rain that runs down surfaces like paved streets, parking lots, highways, rooftops. When running water hits these surfaces, it can take all sorts of pollution with it like pesticides, fertilizers, oil, animal waste, trash, and soil. Then the water could flow straight into local lakes, bays or streams. It may also go through storm pipes, from where it will be released into a local waterway. What’s worse is that in urban areas the large artificially constructed surfaces increase peak flows, which have various hydrologic effects like loss of habitat, instream sedimentation, and streambeds channels. 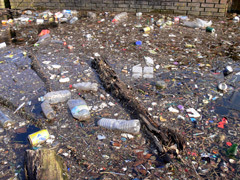 The amount of pollutants in storm water is quite significant due to the runoff volume, and in general, these pollutants are not safe for human health. These harmful elements include bacteria, organic compounds, viruses, and toxic metals. It is certainly not safe to drink it, and you shouldn’t swim in it either. Polluted storm water may cause some beaches to be closed, and it can trigger algal blooms that are toxic. Posted on June 8th under Pollution Reduction.